Sometimes we almost feel like those Japanese ranchers who spend so much time and effort fussing over their Wagyu herds, the kind of cattle that produce kobe beef. We don’t massage our heritage Mulefoot pigs, but we have crowned them kings and queens of the farm. Crushed grapes from Bookcliff Vineyards get delivered to the pigs. Spent grains from beermaking? Our pigs scarf them down. When we are finished with harvesting a field, which normally means the field still holds plenty of leftover tomatoes, peppers, Swiss chard or whatever we were growing, the pigs take over the plot, eating nonstop between their many naps. 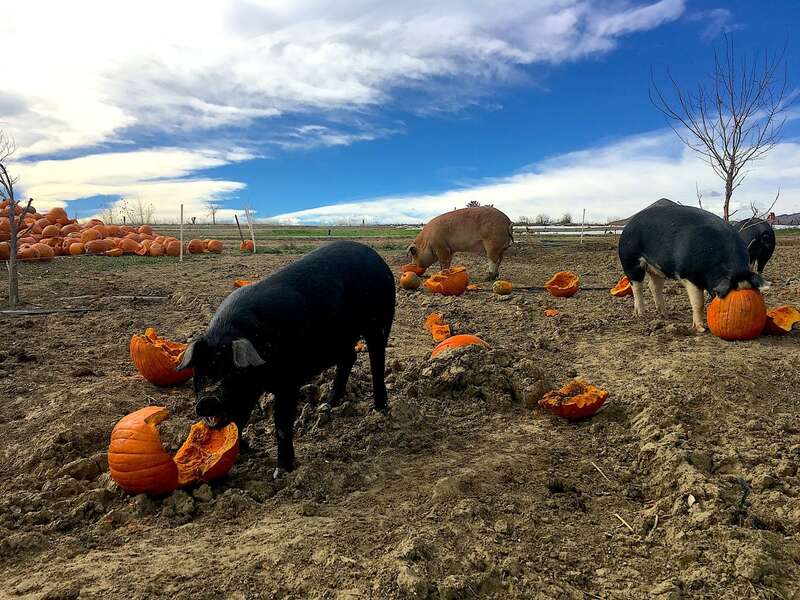 The team from Black Cat Farm tossing pumpkins harvested from Munson Farms in Boulder, Colorado to pigs. Halloween is the best holiday for our pigs. The day after, we harvest pumpkins from Munson Farms — after Halloween, demand for non-culinary pumpkins craters — and bring them to our royal family. The kings and queens, earls and countesses and dukes and duchesses respond with immense enthusiasm. Pigs devouring just-harvested pumpkins that the Black Cat Farm team harvested from Munson Farms the day after Halloween. As we have written before, we crown our pigs for good reason — in many ways, the farm revolves around them. When we first started farming the 30 acres where we grow most of our vegetables, grains and legumes the soil was poor. But thanks to years of hard work by the pigs and quite a bit of farm-team management, the soil now nurtures a wild diversity of plants filled with flavor and swollen with healthy life. The high quality of our plants, the vast majority of which end up on dinner plates in our restaurants or in home kitchens, stems not from members of the farm team pampering every leaf, tuber and fruit. An awful lot of the sensory pleasures that our plants deliver find roots deep in the soil, and we can thank the royal family for transforming so much hard-packed dirt into vigorous, complex and life-abundant ecosystems. And now, the Famers’ Market list.